AVAILABLE FOR DIGITAL PURCHASE HERE! Conceived by indie comic book and animation sister-team, Shawnee´and Shawnelle Gibbs, the Glyph Award-nominated "The Invention of E.J. Whitaker" is a 28-page comic book tale mixing elements of Adventure, Romance, Historical Fiction and Steampunk to tell the story of one heroine's epic journey through the cultural and gender land mines of the early 20th century to become a bonafide inventor. Welcome to the world of Ada Turner and her secret life as E.J. Whitaker. When Ada Turner, a young Inventor's apprentice, creates a flying machine in 1901, she's introduced to the dangerous side of the Industrial Age. When "E.J's" patent for a wondrous flying machine begins garnering national attention, Ada finds herself relentlessly pursued by William, a mysterious young businessman and his colleague, Samuel. Ada must keep her identity and popular invention under wraps but can she, as more and more powerful people set sights on EJ Whitaker...? People with intentions to use the inventions for their own financial gain and get Ada out of the picture. A recent Census Bureau report showed that Women remain significantly underrepresented in engineering and computer occupations, occupations that make up more than 80 percent of all STEM (Science, Technology, Engineering and Math) employment. Blacks and Hispanics have been consistently underrepresented in STEM employment. We believe stories like EJ Whitaker are key in creating heroes that spark the belief that we can continue breaking down the walls of centuries past. The need for stories from and for multi-cultural perspectives in the world of steampunk and sci fi adventure is a big reason why we chose to tell a story in the genre. With so much development in STEM and STEAM education, we’d love to contribute to the vast land of stories and myths that inspire young men and women from all walks of lives to continue dreaming, creating, and soaring in the 21st century and beyond. On February 25th, 2016 The Gibbs Sisters launched a Kickstarter campaign to fund the first issue of "The Invention of E.J. Whitaker." With the support of 442 backers, the project exceeded it's goal by $10,000 and the sisters were able to secure funding for the series' first two issues. The Kickstarter funding will be used to help assist with art production, printing costs, limited edition prints and fundraising gifts for donors. Our long-term goal is to make "The Invention of E.J. Whitaker" a 5-issue series, so that readers can continue the adventure as Ada runs into historical icons including Thomas Edison, Nikola Tesla and more on a journey that follows our protagonist and her trusty team of thrill-seekers cross-country and around the world. The Gibbs Sisters plan to continue to work diligently to bring the next 3 issues to life culminating in a gorgeous 120 + page, full-color graphic novel. and won Best Animation at the Montreal International Black Film Festival. The sisters’ﾠ work in comics continued with their comedic Young Adult time travel series, "Fashion Forward," which began as a popular online webcomic and made its comic book debut on Comixology in 2015. The series was hailed as “one charming comic book adventure” by Brian Cronin of Comic Book Resources and declared ‘Witty, fun and upbeat’ by Girls Read Comics. The sisters have also written the graphic stories “Good Mourning, Jacob” and “Tati” for Graham Cracker’s Comics' Ladies Night Anthology. The Gibbs Sisters’ storytelling abilities are multi-platformed, and in addition to weaving tales for comics and animation, they’ve crafted stories for non fiction programming for networks including BET, NBC, ABC, Food Network, Discovery Channel and National Geographic. The sisters are 2011 fellows of the Guys Hanks and Marvin Miller Screenwriting Fellowship at the University of Southern California and are members of the Writers Guild of America, Organization of Black Screenwriters and Women in Animation. Hasani has worked as a digital artist for Disney Animation and Disney Consumer Products.ﾠ He's also served as a researcher for the University of Florida’s Digital Worlds Institute contributing to educational gaming projects as Art Director.ﾠ A native of California, Hasani graduated from San Jose State University with a B.F.A. in Animation.ﾠﾠ He then went on to achieve a M.S. in Digital Arts and Sciences from New York University. Inspired by Highlights, Saturday mornings, and the unknown extreme sport Cloud Hunting, ACTIVITI 8's U U R L is among Connecticut's stable of skilled artists. He executes illustrations with a focus on story first, adept in both traditional and digital techniques. U U R L's work captures an awesome amount of motion and energy. The Gibbs Sisters met East Coast-based Earl Womack at Long Beach Comic-Con and have been Team UURL GREYY ever since. When Earl surprised them with BOMB fan art for their then-online comic web series, Fashion Forward, they knew the three of them shared some sort of six-legged spirit animal. Earl created the fun horse & carriage scene for E.J. Whitaker and solidified himself as its cover artist. He is a stealth ninja of a figure but look up in the sky on a clear night and you might see him shooting past Venus or moonwalking during an eclipse. political cartoons, and various endeavors throughout the California Southland. "I strive to put quality into whatever I create." Mark Hernandez and the Gibbs Sisters' previous collaborations include the award-winning short animated film, "Sule and the Case of the Tiny Sparks," where Mark served as Storyboard Artist for the film's memorable and challenging bee scene. The sisters were floored by Mark's style and over the years partnered for some of the key concept art for EJ Whitaker. His line and figure work absolutely encompasses the era and romanticism of the story. Breathtaking! Starline Hodge was born and raised in Miami, FL, but currently lives in Los Angeles. She earned a BA in Digital Arts and Sciences at the University of Florida, where she learned that she likes to make cool drawings and graphics all day. She's currently a Graphic Designer for Discovery Digital Media LA, for the DeFranco Creative Division. She's also a renowned comic book artist and dynamo creator of the popular online webcomic series, Candi Comics. 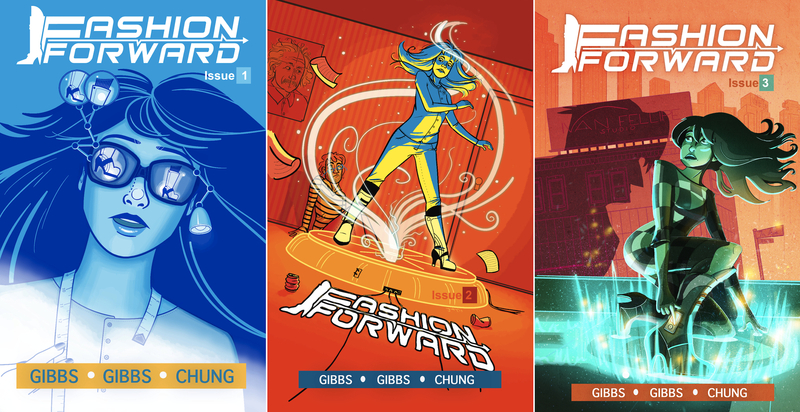 Starline and The Gibbs Sisters previously collaborated when she created the eye-catching logo for their comic book series "Fashion Forward," where Starline also served as colorist and graphic designer. Shanna Lim has worked in the film and animation industry as a 3D artist on such memorable films as Dreamworks’ "Kung Fu Panda," "How To Train Your Dragon," and "Shrek 2" just to name a few. She recently decided to follow her lifelong passion of being an Artist/Illustrator and is currently freelancing for clients including Disney Consumer Products and Nickelodeon. Shanna holds a BFA in Graphic Design and Fine Art from UCLA, and is a wonderful and versatile addition to the E.J. Whitaker team. June Park and Sharifa Patrick. SHARE 'E.J.' ON SOCIAL MEDIA! Follow us and feel free to share the journey of "The Invention of E.J. Whitaker" with your friends and family. Many thanks for your social media support! Issue #1 of the series is NOW AVAILABLE for digital purchase via BopSee Books! Send us a line about The Invention of E.J. Whitaker! We'll answer every inquiry as quickly as it is received.